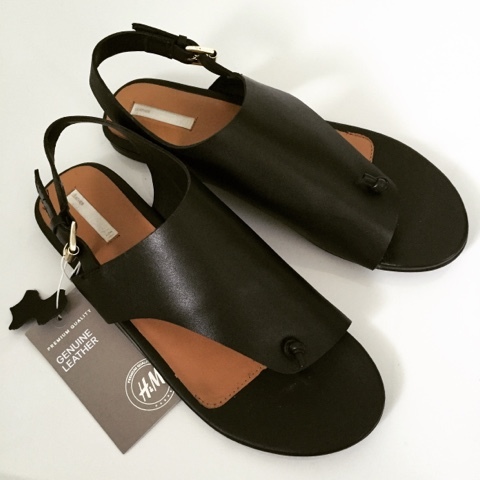 So when I saw these sandals on Sue's and Michelle's blogs, I first went to 2 local stores to see if I could find them. also from the Premium range and also gorgeous leather for £24.99 so I was able to gauge the sizing but there no sign of the ones I wanted. So reluctantly on Sunday evening, I ordered them online together with the pink version of my favourite off-the-shoulder top, nicely reduced in the sale, and this grey vest that I'd spotted over on another favourite blog of mine, Buy Now Blog Later. And I braced myself for the long wait. But lo and behold, I got an email on Monday telling me my parcel was dispatched...followed by a text on Wednesday telling me it was with my local Hermes delivery man. Which is why I'm here on Thursday telling you all about it and modelling my new sandals. Cue one very happy blogger...I didn't even have to select premium delivery - that was all on the standard delivery of £3.99, and I had a voucher code for an extra 20% off sale prices which cancelled out a bit of the cost. 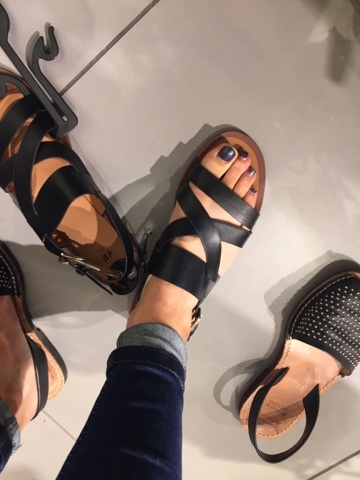 I'm just sharing the sandals for today as it was too cold to wear the tops but I did try them both on briefly this morning and they're keepers. I'll leave you with today's jersey-tastic outfit...all in honour of a physio appointment this afternoon. 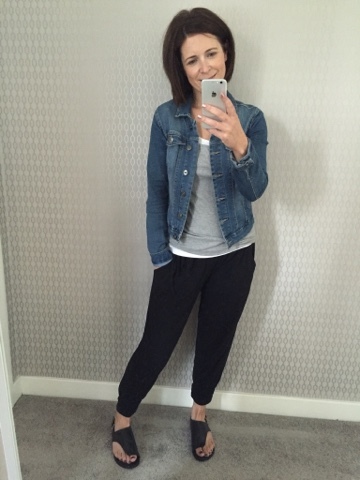 I had forgotten how comfy these harem pants are from Hush - 20% off at the moment too....like wearing jammies all day. Jersey Harem Trousers - Hush - size down! The sandals come in a proper shoe box and if you do buy them and you like the smell of leather...just wait until you open that box! They smell amazing. Fit wise, they are good for wider feet and I sized up to the 6.5. I always do with sandals as I cannot cope with foot overspill! They also come in a brown/tan colour way which you can see on Sue's instagram here. I'll show you the tops when the weather warms up a bit. Right now I'm wearing a massive coatigan and scarf. Indoors. My kids finished school today for 9 weeks...I'm about to have a glass of wine to celebrate help me forget. Thanks for the lovely mention Avril and isn't it nice to receive H&M goods all nicely boxed up for a change because they are part of the premium range. I was very impressed. I've not worn mine yet - the weather has not been playing ball at all and I'm still in my trainers or skate pumps. Boo to this weather! Love the off the shoulder top. What size did you get and Is it true to size? Sometimes I find h&m sizes a bit erratic.